The University of San Diego in the USA, and UKZN’s Howard College campus present a South African version of A Raisin in the Sun which explores racism in both USA and South African politics, all mediated through this seminal 1965 play written by Lorraine Hansberry. The play was co-directed and adapted by Prof Niyi Coker and Kamini Govender, the play is set in 1986, South Africa. An exploration of the Sithole family, whose everyday existence is pervaded by an oppressive system, in the slums of Durban. Lena Sithole, a single mother and grandmother lives with her daughter Beneatha and her son Walter (as well as his wife, Ruth and their son Travis). The family lives together in a rundown two-room house. Not only do these characters feel confined by their physical home space, they also feel restricted by the social roles they’ve been assigned. The play explores what some families go through behind closed doors, the brutal truth carried by the play is haunting also it acts as a window to every family that struggles yet still has dreams and hopes to reach a better life. This play speaks of black experience and its reverence. Watching the play, was nostalgic, I realised, that these stories, these journeys, these characters are as relevant as they were back then grappling with the injustices and challenges of being impoverished and having dreams ended because of where you come from or who you are. In addition, the set was of true reflection of where most black South Africans grew up, a room that becomes a kitchen, a dining room, a sleeping room and … a battle field. The hanging window, upstage middle left was intriguing because it allowed characters to stand there and busk in the light while they hoped in their dreams. The light emphasized a new day. Adapting a play is not a minuscule task especially when adapting a play to a specific time or cultural setting; you do that because there is relevance which Prof Coker and Govender have done appropriately. 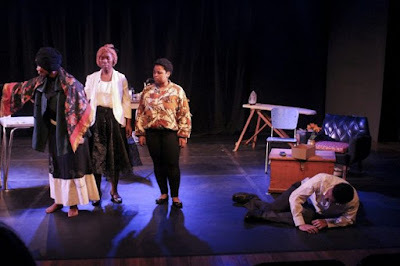 However, I missed the South African family structures and relations which were not fully explored in this adaptation and that could have strengthened the relevance of the play especially for South African audience today. The play is set in the late 80s which historically was when families integrated to suburban areas. Then the question remains in me - Is it enough to base adaptations to historical relevance only?